Llandudno is a lovely Victorian-era seaside resort. The town has been given the title “Queen of the Welsh Resorts”. It is located on the picturesque north coast of Wales. At one time it was a favorite place to visit for Queen Victoria. The town has an old-world charm and it’s located in Conway County borough on the Creuddyn Peninsula.. It is easy to reach by road and rail and for visitors there are many things to do and see. Bronze Age Copper Mines offer a tour which includes a talk about the mine and you can see tools that were found in excavation. For families with children there is Alice in Wonderland Trail which offers a trip along the way which Alice took. The author Carroll was inspired by this town and in this exhibit there are expertly crafted statues all over the town. Bishop’s Quarry is a large exposed rock that is close to the Great Orme Summit Complex. Here you can see pre-historic fossils and get great views of the Snowdonian Mountains. If you enjoy art Oriel Mostyn Gallery exhibits the contemporary art and design works of local artists. 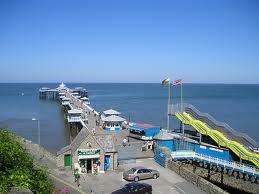 The Pier which is the longest and finest in Wales is the second longest Victorian pier in Britain. Here you can find themed gift shops, cafes, bars and attractions for the entire family. It dates back to the 1800s. Home Front Museum incorporates a recreation of a war-era street and has long been a popular tourist destination. 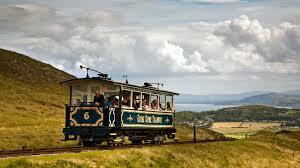 Have some fun and take a ride on the Victorian Tramway up to the summit of the Great Orme. It was built in 1902 and is the only remaining cable-hauled tramway in Great Britain. At the summit you will find a small selection of shops, a café and a bar. It also offers fantastic views of the North Wales coast. Another fun place for families is Bodafon Farm Park which is a working farm where you can see llamas, deer, goats and a bird of prey sanctuary. There are pony rides, café facilities and a band on Thursdays. At the east end of the promenade you can take a dip in the lovely, large paddling pool and on the west side of the pier you can take stairs to some rock pools. Along the hilltops there are Iron Age and Celtic forts and you can explore some castles such as Conwy Castle which is a World Heritage Site. You get to see well-preserved town walls, Aberconwy House from the Middle Ages and a wonderful Suspension Bridge. At Llanrwst down into the valley there is Gwydir Castle, a good example of a Tudor house. As an added attraction you get to see peacocks and even a resident ghost if you’re lucky. For those who love nature and love to be active a must is to visit Gwydyr Forest Park. It is most lovely woodland with plenty of bluebells, hidden mountain lakes, rushing rivers and waterfalls. You can enjoy walking trails and mountain biking tracks. When you have had enough and you want to relax there are scenic picnic sites to enjoy. So come and explore and play in the sand and the sun of the lovely beaches. 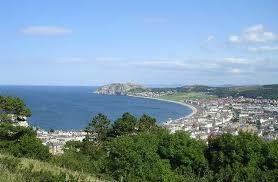 Llandudno offers lots for families to do and enjoy. You can also tour the town by water way, by tramway or by a sightseeing bus through the town. Once you have seen all there is to look at and explore you can take your time to decide which places you will want to visit and take a closer look at.